The Amtrack Room of the Holiday City Ramada Inn played host to the Fellowship of Christian Athletes’ annual Coaches Clinic. Speaking at the event was Todd Gongwer, a motivational speaker and author of the book Lead For God’s Sake. Recently making the news due to Ohio State University Football Coach Urban Meyer naming the book as a motivation for him to get back into coaching, Gongwer hasn’t changed his message now that he is a better known commodity. And that message is that character builds teams, and that it starts with the coaches. A common theme in Gongwer’s presentation was the constant blaming of players by some coaches for not being receptive to their coaching style. He’s quick to point out that most coaches who say such things typically haven’t taken the time to get to know their players and understand what problems they may be experiencing. Yelling at a kid may work in the short term, but caring for them, and trying to make them better people will always work better. “Love is the greatest motivator.” Gongwer reminded. The speaker also mentioned how modern technology has made communication more difficult. This goes for both players and coaches. Paying attention to one another is extremely important. Gongwar pointed out how such forms of communication don’t translate into sports as well. Another topic which kept arising in Gongwer’s words was the idea of prioritization. While coaches may say they are in sports strictly to help the kids, there is almost always other motivations behind their career choice. And that’s okay, according to Gongwer, as long as they understand what is most important about what they do. It’s fine for a coach to want his team to be the best, but that same coach needs to understand that such a title is a subjective term. Instead, their primary focus should be on getting their kids to perform at THEIR best. Family was something stressed by Gongwer as well. This is the message that caused Coach Meyer to reach out to him. The Ohio State Coach felt he was losing his family, and Gongwer’s message helped him to put things back in perspective. And that message was that there are more important things than winning, such as family and helping one’s players to grow as individuals, as well as players. While their relationship has been vastly overblown, Gongwer does still text Meyer on occasion. The purpose of these texts are to try and keep the National Championship caliber coach on the right track. There have been a few instances where Gongwer has seen Meyer possibly slipping back into his old ways, valuing winning over all else. During one of these times, he texted the coach a message stating that he may want to read the book again. Gongwer was a hit with all the coaches in attendance. Members of staffs representing everywhere from Liberty Center, Defiance, and Hillsdale, to more the local school’s such as Montpelier, Fayette, and North Central were enthralled by the event and its guest speaker. Now, all each one has to do is decide for themselves what their top priority will be. © 2015 – 2018, The Village Reporter and/or The Associated Press. All rights reserved. 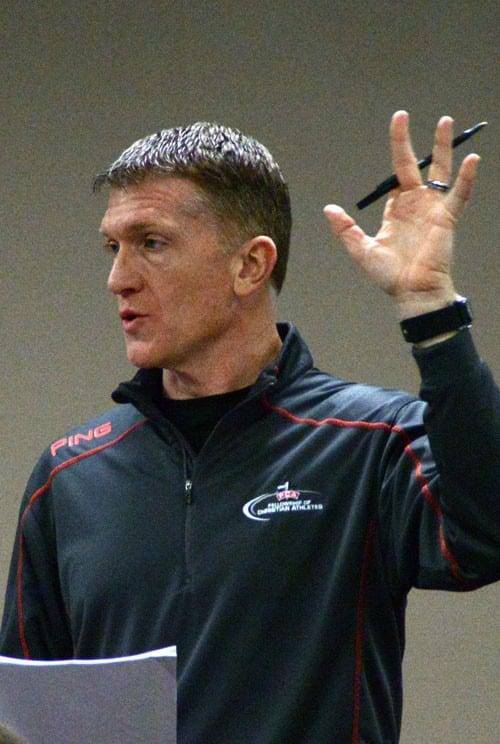 Be the first to comment on "Gongwer Speaks At FCA Coaches Clinic In Holiday City"